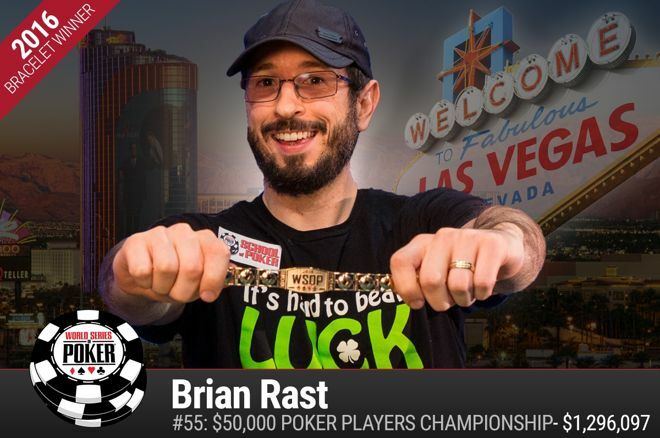 Brian Rast claimed his second WSOP $50,000 PPC win, and, he hopes, the respect of all of his peers. Brian Rast joined Michael "The Grinder" Mizrachi among the ranks of two-time winners of the $50,000 Poker Players' Championship. His second Chip Reese Memorial Trophy — he also won the event in 2011 — netted him $1.296 million for defeating an elite field of 91 players at the 2016 World Series of Poker. Mizrachi made a spirited bid for his third title in the event, and after Ray Dehkharghani and Lamar "Wil" Wilkinson busted out relatively early on the final day of the event, a four-handed dogfight ensued between Rast, Mizrachi, Justin Bonomo, and Eric Wasserson. Bonomo and Mizrachi led the dance, trading the chip lead early while Wasserson and Rast awaited their spots. Wasserson found one in no-limit hold'em when Mizrachi bluffed all in on a board of , only for Wasserson to quickly call with the . Suddenly, things were tight, and the four-handed battle lasted a few hours before Mizrachi fell in fourth after a slide in both Omaha rounds cost him most of his stack. Bonomo was the beneficiary of much of that, and it looked like his tournament to lose when he had nearly 19 million chips out of about 23 million in play three-handed. That's when Rast got hot, dragging a number of pots during the limit rounds to get to a respectable stack of 8.5 million after busting Wasserson in a stud hand that ended up being a race to a pair, which Rast won after starting with queen-high against ace-high. Rast is most well-known for his success over the years in big-bet games, having long been a player in nosebleed cash games. He has played for some of the highest stakes online, played in "big PLO and no-limit games all around the world," and recently been a regular in the $100,000 buy-in big-bet mix at ARIA that Phil Galfond mentioned in a recent interview with PokerNews. Rast feels his limit skills go overlooked, and that's one of the reasons his success in the PPC has been so satisfying for him. "Part of the reason why this is so gratifying and satisfying to me is it was a mixed-game tournament, and I felt a little slighted going into it in some of the limit games," he said, alluding to a number of side bets he made against players booking against him. "It was satisfying from a professional standpoint that I did this. I play a lot of poker for really big stakes, so I'm not always playing my 100 percent A-game, but getting all that extra on it put me in the zone early in this tournament." Heading into the heads-up match with Bonomo, who has also made his name in big-bet poker, Rast was looking to use the limit rounds to attack his opponent while keeping pots smaller in the big-bet games. Indeed, Rast grabbed the lead in limit Omaha and extended it in razz, but the deciding hand ended up coming in exactly the spot Rast initially hoped to avoid. On the final board read , after bombing an overbet in on the turn, Bonomo shoved on the end after Rast checked to him. Rast immediately called with the after double-checking his hole cards, and a shellshocked Bonomo showed the before cursing softly and leaning back in his seat, mouth agape in disbelief. "I think the line is very clear," Rast said when asked for his thoughts on the final hand. "Check-call. He's going to have bluffs, and if he has a big ace himself, he's going to value bet. The river is kind of a sick cooler, of course." Asked if it was his toughest and most satisfying win, Rast thought for a bit and then said that it was. After celebrating briefly with his father and friends on the rail, Rast turned serious when asked what his second PPC and third bracelet overall means for his legacy in the game, and if he even thinks about such things. "This is what I've chosen to do with my life," he said. "I would be being dishonest if I said that I didn't think about that. "I don't care what everyone in the world thinks, but I definitely care what other poker professionals think. I take poker pretty seriously and what my legacy is or how I'm viewed by my peers is important to me as a form of professional respect. From that aspect, what I was able to do here today was obviously something really special." Still, the winner of the 2015 Super High Roller Bowl for $7.5 million called himself "blessed and lucky" to run good in so many huge tournaments. He was quick to acknowledge the role of luck in any tournament win. That's why in his mind, those successes take a backseat to his long history of playing in some of the biggest cash games in the world. Rast noted that he has played some of the biggest limits in the world in "almost every game," listing some $1,500/$3,000 and $2,000/$4,000 games on his ledger to go with the aforementioned nosebleed experience. "I'll play anything for just about any amount of money with anyone," he said. "That, to me, says a lot more career-wise than some tournament wins."